There are hundreds of beautiful shrubs and flowers you can plant during the springtime to bring colour to your garden, but what about during the fall? As the last few warm months of the year come around, many gardeners find themselves at a loss as they try to add more colour to their garden. If you’re finding yourself stumped as you make your fall gardening plans, consider some of the recommendations below to add a splash of fall colour to your garden. Just as some plants thrive during the spring or summer, others flourish in the cool fall months. In order for your fall garden to really shine, you should know when and where to plant your flowers, trees, and shrubs. For most climates, you should plant your fall garden during late September or early October. Prior to selecting plants for your garden, make note of your area’s hardiness zone, and choose your plants accordingly. There are hundreds of colourful plants which thrive during the fall months, when planted at the right time and location. The best plants for your fall garden will depend on your climate and the look you are trying to achieve. We’ve put together a list of some popular fall favorites to help inspire your next gardening project. If you’d rather stick to bulbs, consider toad lilies, cyclamen, or autumn crocus to bring colour to your fall garden. Alternatively, perennials such as asters, chrysanthemums, and goldenrods can be planted for quick and easy colour year after year. These perennials will continually bloom during the cooler months, and are known for their trademark autumn beauty. Once you’ve chosen cool-season flowers for your garden, you may want to consider adding additional colour and texture with a few trees or shrubs. Many trees and shrubs change colour during the fall months, but some deliver more exceptional autumn beauty than others. Witch hazels, Ginko, Smokebush, Redbuds and Japanese maples are among the most stunningly beautiful fall trees, and are a common attraction in many fall gardens. Their leaves put on a breathtaking display of yellows, oranges, reds, and purples as the cooler months set in, making them a favorite among gardeners around the world. Alternatively, you may consider adding certain types of roses to your fall garden to give it a uniquely stunning look. Virginia Rose and Blue Ramblers offer bright, beautiful colour long after their blooming season has ended, thanks to the unique allure of their leaves during the autumn months. Many ornamental veggie varieties flourish during the autumn months, making them a welcome addition to many fall gardens. Ornamental peppers and kales offer a range of beautiful colours, making them excellent complements to your fall flowers, trees, and shrubs. They offer a unique look you won’t see in every garden, so you may want to consider them as an addition to your fall gardening project. 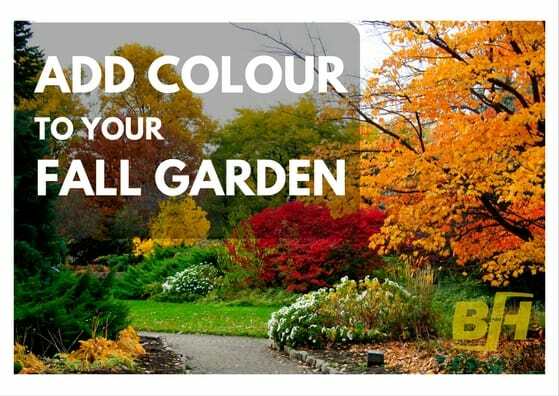 As summer nears its end, gardening season doesn’t have to – by planting the right flowers, trees, and shrubs at the right time of the year, you can add breathtaking fall colour to your garden with ease. If you’d like to know more about which plants will thrive in your climate during the autumn months, contact Bur-Han today. We are the experts in gardening, landscaping, and lawn care, and we’d love to help you plan your next project.